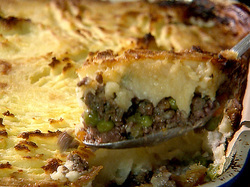 Shepherd's Pie not commonplace on a Desi restaurant menu. However i have come across the videos below proof that even this dish has not escaped the Desi influence hence i present you Shepherd's Pie The Desi Way. Spice up your evening meal and try one of the recipes in the coming weeks and remember if you have a twist on this recipe send it in and we shall share it on this site. Remember please if you have any recipes for Shepheards Pie prepared The Desi Way contact us and we will be happy to share your ideas, recipes etc on this site this is also one of my favourite foods so would love to hear about unique spins on this traditional British dish.